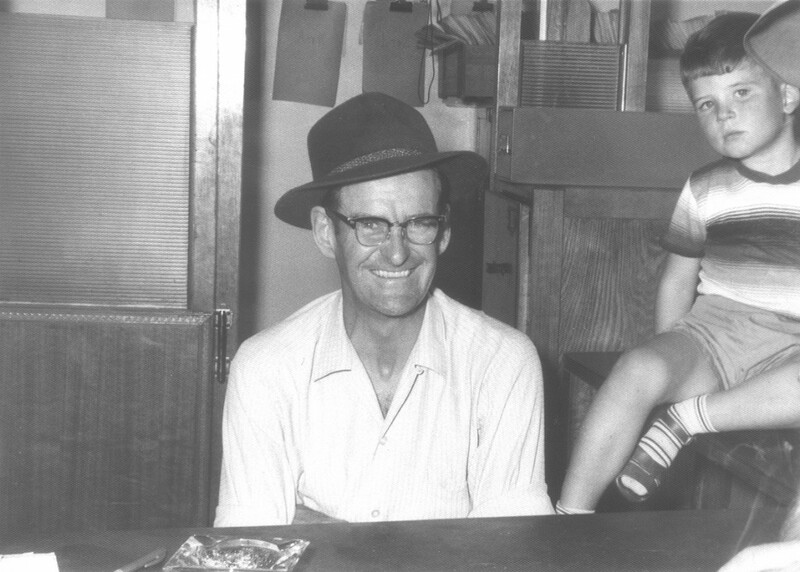 In 1959, mechanic (and former farmer's son & butcher) John McNaughton was persuaded to sell his share in his Mobil garage and purchase E.W.Sampson real estate and insurance agency. The seller was Roy Sampson whose uncle Eric had started the business in the 1920's. Roy was John's former employer who had also sold him the garage business. He saw potential in this Little River larrikin that others may not have. So before setting off to pursue his dairying interests in Gippsland, Roy Sampson gave John McNaughton the opportunity that would change his life. John enlisted his wife Patricia as his partner in this new enterprise and together they prospered while raising their young family in the small house behind “the shop” at No. 36 Watton Street. And while the home was small, the children were compensated by having a huge yard (now part of Comben Drive carpark) and the Werribee River as their playground. Insurance was the mainstay of the business in those days. John was particularly proud of the high percentage of Werribee South farmers who insured with him, and while driving through the area on his many personal visits to his clients, he would habitually point to a farm, rattle off the farmer's name and pronounce ....“they're with us”. This personal approach created loyalties and friendships through generations, and many of John's original clients were still 'with him' when he retired in 1994. While Werribee real estate was still very small scale, big changes were on the way with the creation of the new localities of Hoppers Crossing and Wyndham Vale in the mid to late 1960's. J.H.McNaughton played a central role in this new era through their long association with the Carter family. Widely known for their successful poultry operations as well as their innovative approach to the welfare and housing of their workers, the Carter dynasty naturally moved into property development. As exclusive selling agents for “Windermere Estate” (now Wyndham Vale) and “Ribblesdale Estate” (the former Carter poultry farm site in Greaves Street South), McNaughtons helped hundreds of families get a start in home ownership. And it's an often told story that many young Werribee residents were instructed by astute parents to “go in and see Johnny McNaughton”, and then to be driven out to look at a paddock and asked to pick out a block that was still only lines on a map - and make what was probably the best investment decision of their lives. In 1971 John and Pats' son Adrian joined the firm, having worked for three years for United Insurance. Adrian quickly emersed himself in all facets of the business. He took on heavy responsibilities for someone his age and was soon an Auctioneer and Estate Agent in his own right as well as being active in the Western Suburbs branch of the REIV. His youth and enthusiasm made him a popular figure both locally and in real estate circles. Adrian's management took J.H.McNaughton from being predominantly an insurance agency, through the transition into the progressive real estate company it is today. All four McNaughton children have been involved in the business. While second son Don joined in 1983 and is now sole director, daughters Anne and Cathy have also worked in the office, making it a real family concern. This was never more so than during the 1970's and 80's when Saturday mornings at McNaughtons, as well as being “rent day', was a time for clients and friends to drop in and catch up on what was happening around the town. This atmosphere of stability and familiarity was of course further enhanced by the dedication and loyalty of our staff. Most notable for their faithful service over many years are Deanne May, Victor Dzienio, Carmen Littley, Natalie Elford and Anita Ryall. And now as the City of Wyndham seems to grow by the hour, and we welcome more and more new residents into what was once our little country town, we at McNaughton Estate Agents believe it is important to remember where we've come from. Because in this highly competitive marketplace where we strive for success and embrace all that is new in marketing and technology, we will never forget the people and values that have brought us here.